Those little pieces of weather stripping in between your doors and frames play a critical role in keeping your home energy efficient. Your doors are part of a larger system of materials that work together to protect and seal the entrances of your home. In southern Louisiana this usually means keeping the cool air in and the hot air out. This system consists of the doors, the threshold and the weather stripping that provides the seal between the two. Many homeowners overlook the vast importance of well-maintained weather stripping materials, especially when it comes to maintaining top energy efficiency in your home. As mentioned, weather stripping fits between your door and the doorframe or threshold. The stripping can be made from a wide variety of different materials including rubber, felt, foam, vinyl or metal. The weather stripping is generally adhered to the doorframe, so that when the door is closed, light and air are unable to leak through the opening. The materials are strategically sized and placed in order to eliminate any gaps that would otherwise be present when your door is closed. It can be very frustrating to have to pay astronomical heating and cooling costs during the winter and summer months. One of the reasons that the heating and air equipment in your home needs to utilize so much energy is because the air that is being heated or cooled is leaking through the gaps around your doors. Basically, you are wasting your energy because you are unable to control the airflow in your home. Drafty houses are typically much more expensive to heat and cool. Many of the drafts that make it difficult to control the temperature in the house are located around the doors. According to Home Advisor, air leaks can account for as much as 30 to 40% of a house’s total heating and cooling losses. Home Advisor also explains that air leaks can cause more harm than simply increasing your energy costs every month. As warm air leaves your home during the winter and seeps into your house during the summer, it brings moisture into the house as water vapor. This moisture can make its way into your walls and insulation, causing considerable damage and potentially leading to mold and/or mildew. How Do I Choose the Right Materials for Weatherization? Adding weather stripping is a way to “weatherize” your home. The United States Energy Department suggests that you choose your weather stripping materials carefully in order to provide the highest level of protection possible for your home. They suggest choosing materials that will withstand temperature changes, friction and the wear and tear associated with the opening and closing of your door. 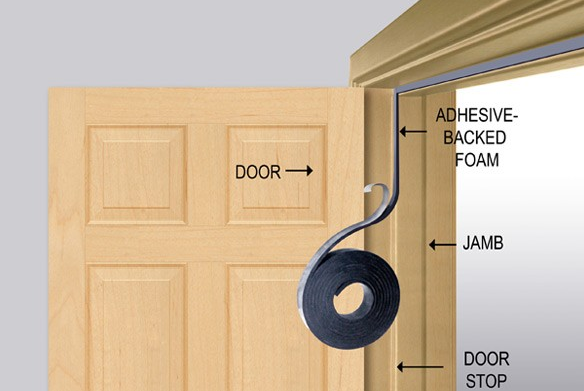 Reinforced vinyl, foam and silicone are among the forms of durable weather stripping materials that provide moderate to high amounts of protection for doorways. The stripping around your door is subject to a lot of wear and tear as the door is opened and closed every day. It may be necessary to replace sections of your weather stripping, or the entire strip, if damage has occurred. It is best to inspect your doors at least once a year in order to identify these problems before they become costly issues. A simple way to check for leaks in your weather stripping is to carefully and safely hold a lit candle or lighter an inch or two away from the stripping, moving it slowly around the perimeter of the door. If the flame moves, there is airflow, and it is time to make some weatherization improvements.